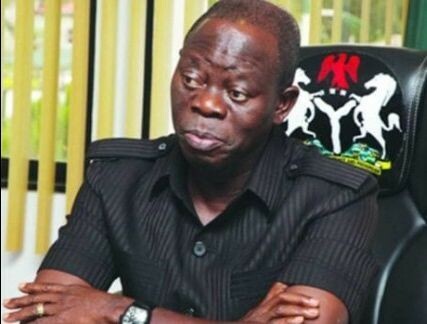 Group identified as Nigeria Progressive Vanguard on Wednesday described fraud allegation levelled against the Chairman of ruling All Progressives Congress (APC), Adam Oshiomhole as handiwork of ‘undesirable elements’. The group stated this in a statement signed by trio of Dr. Mohammad Ishaq, Prof. Mrs Joyce Abba and Alhaji Abubakar Jalal; President, Secretary and Political Coordinator respectively. The statement read, “it has come to our notice that some undesirable elements are gradually but steadily unveiling an orchestrated plan, aimed at tarnishing the good image of the APC National Chairman, Com Adams Oshiomhole. “After trying different ideas without success, they’ve now come out with frivolous accusations of fraud against the amiable Party Chairman and at the same time putting unnecessary pressure on the anti graft agencies to arrest and prosecute him. “It doesn’t require rocket science for one to know that those behind these shameful acts are non other than enemies of progress who are visibly unhappy with the principled stance that Com. Oshiomhole has taken since assumption of office. “Those who before now taught they own the party in their respective states were cut to size, hence their resolve to fight dirty. “Consequently, they have embarked on a campaign of calumny aimed at distracting and sabotaging the APC National leadership and the APC led federal government. We wish to inform them that they will fail, because a new sheriff is now in charge. “We call on the APC National Chairman Com Adams Oshiomhole to ignore these detractors and remain focused on the good works he is doing. We the masses are solidly with him and President Mohammadu Buhari. They should not succumb to any form of intimidations and blackmail. The task of rebuilding Nigeria and strengthening democratic principles are jobs we cannot compromise on.